Gut health has been linked to immunity, glucose control, heart health, and digestion (4, 5, 6). Recent research has even discovered links between gut health and mental health (7). It’s safe to say that an unhealthy gut can cause problems in every part of your body. The Candida diet is designed to improve gut health, reduce inflammation, and boost immunity. The principles of the diet include removing added sugars, consuming fermented foods, and avoiding pro-inflammatory triggers like gluten and processed foods. The foods to eat on the Candida diet include non-starchy vegetables, fermented foods like yogurt and sauerkraut, low-sugar fruits like blueberries, proteins like chicken and fish, and pseudo grains like quinoa. The diet is designed to provide optimal nutrition while reducing inflammation and depriving Candida albicans of the foods that it needs. Join 120,000+ readers and get our free, 8-part guide to beating Candida! Ready to get started? Here are some simple rules that you can follow on your anti Candida diet. The most important of these is to avoid added sugars. People’s diets these days are full of added sugars like dextrose, fruit juice concentrate, and high fructose corn syrup. In fact, there are so many different names for sugar that we often don’t even realize what we’re eating. Where possible, you should also avoid inflammatory foods like processed foods, alcohol and caffeine as much as possible while on your anti-Candida diet. By doing this, you can boost your gut health and speed up your recovery. The list of foods to eat includes a wide variety of healthy, nutritious food. These foods are all low in sugar, gluten-free, and unlikely to cause inflammation in your gut. The full list of foods to eat on the Candida diet includes non-starchy vegetables, low-sugar fruits, non-glutenous grains, healthy proteins, some dairy products, nuts and seeds, fermented foods, plus lots of herbs, spices, fats and oils. You’ll be amazed at the number of simple, tasty meals that you can prepare. Just take a look at our recipes section for lots of delicious ideas! Remember to make sure that your meals are balanced. A good example might be an egg salad with a simple dressing of olive oil, lemon, and salt. This nutritious meal contains protein from the eggs, healthy fats from the olive oil, and carbohydrates from some avocado and other vegetables. The Candida diet foods to avoid list includes added sugars, glutenous grains, high-sugar fruits, processed foods, some dairy products, most condiments, alcoholic drinks, and refined oils. Caffeinated drinks should also be minimized as they can worsen gut inflammation. Good alternatives are decaffeinated coffee, green tea, and chicory coffee. There are three simple principles that cover most of the foods to avoid. If you’re unsure about a particular food, just apply these rules. Thirdly, steer clear of inflammatory foods. A gut imbalance like Candida causes plenty of inflammation already. You don’t want your diet to make it worse. The other bacteria in your gut will usually keep Candida albicans in check. But a number of different factors can change this - for example, a high-sugar diet, a course of antibiotics, or chronic stress. When this happens, Candida albicans can quickly expand its colonies and start to dominate the flora in your gut. Candida does not just affect your gut. It also causes vaginal yeast infections, athlete’s foot, oral thrush, diaper rash, and nail fungus. These skin infections are often related to an intestinal Candida overgrowth in the gut. The symptoms of Candida can include fatigue, brain fog, digestive issues, sinus infections, food allergies, yeast infections, mild depression, joint pain, and much more. If you have a Candida overgrowth, or indeed any kind of gut dysbiosis, it is likely to have a significant impact on your wellbeing. The wrong mix of gut flora will impair nutrient absorption from your food, weaken your immune system, and cause bloating and gas. Meanwhile, an intestinal Candida overgrowth is often associated with increased yeast infections, fungal skin infections, and sinus infections. A Candida overgrowth causes inflammation in your gut that can lead to a variety of symptoms. It can damage your intestinal walls, leading to something called leaky gut syndrome, and can disturb your digestion. A pathogen in your gut might not sound like a big problem. But Candida albicans is a special case. It releases up to 79 different metabolites, including uric acid, ammonia, and a neurotoxin named acetaldehyde. Acetaldehyde causes chronic headaches and brain fog, and is classified as a potential carcinogen by the International Agency for Research on Cancer. Uric acid can cause joint pain and lead to gout if an excess builds up. Treating Candida is not always easy because it is such an opportunistic pathogen. Improving your diet, most importantly by removing all added sugars, is the first step. Taking a good probiotic will crowd out the Candida yeast and start to heal your gut. And some natural antifungals will help to reverse the Candida overgrowth. This article was written by Lisa Richards, a certified nutrition coach, digestive health expert, and owner of TheCandidaDiet.com. With 12 years of experience writing about The Candida Diet, our team is backed by certified professionals who specialize in digestive health and naturopathic medicine. We are here to help you with advice, recipes and information about Candida overgrowth and alternative dietary treatment methods. SATISFACTION GUARANTEE: If You Don’t Feel Significantly Better Within 60 Days, Simply E-Mail Us At [email protected]. We'll Refund Your Money, No Questions Asked. 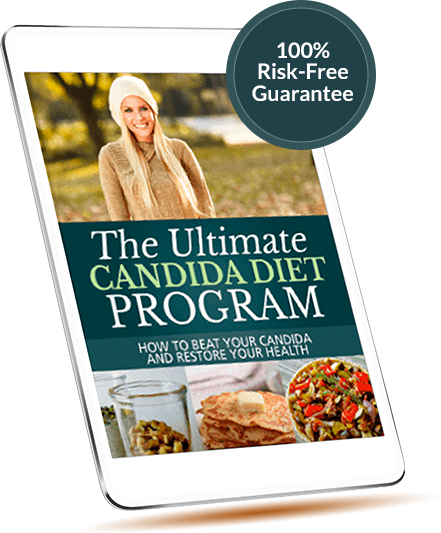 This Candida treatment plan comes in several downloadable eBooks (in PDF format) and an email course, so please note that no physical product will be shipped to you. It is fully compatible with PCs, Macs, iPads, Android tablets and many other computers and mobile devices. You can print it out using any regular printer if you would prefer to read a hard copy. If you have any problems downloading the treatment plan, just contact us here and we will be happy to help you. We’ve put together lots of delicious recipes in this section. We’re always adding more, so make sure to check back in with us. There are also some helpful articles about using antifungals in your cooking, what to drink instead of your morning coffee, and much more! Preparing meals while on the anti Candida diet is much easier than you think. Once you get used to all the new, healthy ingredients, you'll be whipping up tasty meals in no time! I just wanted to express gratitude for your comprehensive program – especially and most especially the recipes! I LOVE these dishes. I am on day 20 and progressing really well so far. I am inspired and determined to continue as long as it takes to finally get well. Hello Lisa, I’ve followed the Ultimate Candida Diet from your excellent guidebook for 115 days now. My constellation of Candida symptoms have subsided considerably, and I generally feel much better. Thank you so much for the wealth of excellent, clear, and straightforward information you provide to candida sufferers! I think your website and your e-book are absolutely fantastic, I really like your way of communicating information. Candida and fungal diseases are serious problems but your way of treating the topic plays it down just enough to convince people in taking action and give them hope at the same time. I cannot tell you how your book and the suggested recipes and treatments have affected my life. They have brought my body back to health. I cannot thank you enough. Your book is amazing. This is an amazing resource that will guide you through understanding and beating your Candida overgrowth. This e-book is very simple, very well explained and detailed. It will guide you through step by step in a very comforting and straightforward manner. The recipes are delicious and very creative, which makes this program very enjoyable! I have been trying to beat Candida for years, but for a long time I didn’t know what I was fighting against. The Ultimate Candida Diet program, and especially the chapters on stress and how to manage it, has helped me to understand what Candida is, why and how it has been ruining my life for so long and how to keep it away. This is a far better way to eat and live, compared to feeling sickly, tired and listless all the time, as Candida can make one feel. I have lots of energy now and my insides feel great! Thanks for a great program! I decided to do some research and came across the Ultimate Candida Diet. It really has helped me overcome my Candida and I have now been Candida-free for 3 months. The book is a wonderful, easy to understand guide and it provides all the information you need to overcome Candida. Hi Lisa, this book is changing my life! I have suffered with severe asthma for decades. I am a month into the program and am no longer needing my asthma medication! Thank you so much! I bought your book yesterday and it has to be the most well-thought-out, comprehensive, well-explained source of information on the planet relative to candida. Thanks. Once I started the plan I noticed an improvement relatively quickly and within three months or so the thrush had cleared altogether. In the meantime I was losing the extra kilos I’ve been carrying around all my life and experiencing all sorts of other benefits I hadn’t anticipated: no more dandruff, no more cystitis, clearer skin, heaps more energy, better sleep, fewer mood swings… I just couldn’t be happier! Thank you once again for putting such a wonderful program together – it’s so easy to understand – it helps make sense of what we’re facing. It’s easy to follow and you provide great recipes that don’t require sourcing unusual ingredients that are likely to discourage people (that was important to me). My energy came back. My digestion improved. I lost weight. And the best part of all – since starting this program more than 1 year ago, I’ve not had a single instance of yeast infection or bacterial vaginosis. So thank you for all the work you have done. I honestly would be lost (and very likely, still suffering), if it weren’t for your book. The blog is where you'll find all the latest recipes, tips and motivation for completing your Candida diet successfully. Looking for an article on a specific topic? Just click on one of the headings at the top the screen.